A new awning could be just the thing to keep attracting customers to your business! Black Friday has come and gone, Small Business Saturday is history, and Cyber Monday is over for the year. How can you keep attracting new customers to your business throughout the winter (and all year)? An attractive new awning! Here are some ideas for your business awning that will keep customers coming through the doors throughout the year. Depending on where your business is located and local requirements, a creative and unique awning might be the perfect way to attract customers. Creative commercial awnings work particularly well in areas with lots of other businesses, as yours will stand out from the surrounding crowd. Pick an awning that shows that your business is different from others and think about how you can use it to reflect your personality. Consider incorporating colors from your logo or special details to make it unique. If you have plenty of space for your commercial awning, don’t waste it! Make sure that your awning does an excellent job of advertising your business name, what you do, and even your address. There is nothing that turns off a customer faster than not being able to spot you from the street or while driving down the road. If you create a cohesive look between your awning design and your advertising, customers will be much more likely to stop in. 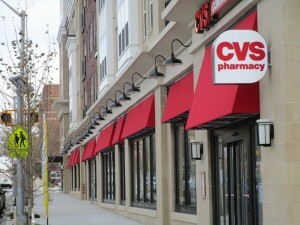 Your commercial awning can, quite literally, outsize the competition to attract customers. Big awnings naturally attract attention and attract extra attention during a thunderstorm or weather event in the city. People who stop under your awning to take shelter on a hot summer day or during a thunderstorm will be much more likely to stop inside and make a purchase. A large awning is particularly great if you rely on foot traffic for a good deal of your business.